Sales negotiating has always been something of an obsession at Common Ground. We're keenly interested in the unique negotiating concerns of salespeople; because when it comes to negotiation training, salespeople have typically been ignored. Much of what today passes as "negotiation training for salespeople" is really nothing more than rehashed sales training. Portraying features and benefits, proving added value, overcoming objections, and asking closing questions are skills essential to every salesperson's success. Unfortunately, these programs have virtually nothing to do with negotiating. When the customer says, "Let's talk price," and the only response the salesperson knows is, "Why don't we take another look at the real value we're providing here," it's not likely to be a very long, or particularly successful, conversation. The customer's "Let's talk price" statement turned the sales call into a negotiation. And at that moment, all of the rep's sales training became irrelevant. Further repetitions of "Here's why we're the best" will only annoy the customer. Why? Because it's haggle time! The customer doesn't want more reasons. The customer wants concessions! 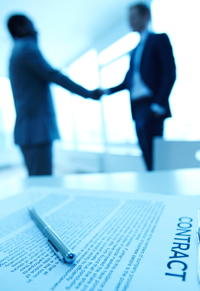 Sales Negotiating is Essential in Today's Competitive Economy. Intense competition, shrinking margins, and extraordinary cost-consciousness are hallmarks of today's economy. And the tougher the economy, the more vital it is to negotiate well. Today, the sales force's bargaining skills can determine whether a business flourishes, endures, or disappears. When margins are fat, it's easy to ignore a few percentage points gained or lost in negotiating. But when margins are slim, those few percentage points can double or triple an organization's profits—or its losses. Sales negotiating is not about boosting revenues or cutting expenses. It's about profit. That all-important line at the bottom of every income statement—"Profit After Tax"—is also a bargaining proficiency score. Sales negotiating is hard, and it's getting harder all the time. Customers increasingly treat goods and services as commodities, ignoring sellers' traditional added-value and relationship-based "pitches." Infused with a sense of "entitlement to negotiate," buyers have never been more assertive. True, the rules of sales negotiating are much the same as those of other negotiating. It is the finesse and grace with which those rules must be used that make sales negotiating so interesting—and difficult. Salespeople Need All the Help They Can Get. Negotiate to WIN for Salespeople will arm your sales force with the negotiating know-how it needs to succeed in today's global marketplace. Participants learn that negotiators' positions often don't reflect their true interests, needs, desires, and concerns. By focusing your sales force on customer interests instead of customer positions, Negotiate to WIN for Salespeople quickly improves your ability to identify high-yield opportunities and build lasting partnerships. Having successfully trained tens of thousands of salespeople, Common Ground knows how to make an immediate and meaningful improvement in the bargaining skills of your sales team. Who Should Attend Negotiate to WIN for Salespeople? Negotiate to WIN for Salespeople is intended for both new and experienced salespeople. As we tailor the program for your organization, audience-appropriate adjustments in content and focus will be made by Common Ground's facilitation and design team. Negotiate to WIN® is not a prerequisite. Negotiate to WIN for Salespeople adapts Negotiate to WIN®, our award-winning flagship program, to the special needs of sales reps. Using Common Ground's unique "consultative negotiating" approach, Negotiate to WIN for Salespeople emphasizes customer focus and trust-building to guide decision-makers into long-term, profitable agreements. Like Negotiate to WIN®, Negotiate to Win for Salespeople creates a "high-immersion" training environment for maximum participation and learning. Instructional methods include multimedia, lecture, group discussion, diagnostic tests and evaluations, simulations, and other interactive techniques. During the program, students are regularly challenged to demonstrate what they've learned through generic and customized case study simulations. 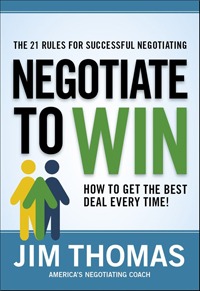 Negotiate to WIN for Salespeople is typically a two-day program. However, program length can be adjusted to fit your requirements—from under one hour to two or more days. Common Ground's experienced and internationally-renowned facilitators bring an abundance of practical and creative solutions to any training situation. Please click here for information about our instructors. Many firms promise tailored programs but deliver the same tired old materials. Common Ground is different. When we say tailored, we mean it. We work with you to ensure that Negotiate to WIN for Salespeople thoroughly and specifically addresses your organization's priorities and concerns. We interview your people and (confidentially, of course) we learn your business—who you are, what you do, how you do it, where your industry stands and where you stand in your industry, what your short- and long-term objectives are, what circumstances your negotiators face, and who your target audience will be. With this information in hand, we prepare unique training materials for you. Tailored case studies—lifelike scenarios that students can instantly relate to—are the best way to clarify, validate, and reinforce classroom concepts, and make them immediately transferable to the workplace. Common Ground is unsurpassed when it comes to the creation of unique, client-specific exercises. At no additional charge, we work in partnership with you to develop convincingly realistic scenarios that will excite and inform your attendees. Negotiate to WIN for Salespeople is flexibly designed to complement and reinforce your organization's current sales training. In all aspects of their work with Common Ground, clients are assured of complete confidentiality. Our commitment to discretion and privacy encourages clients to give us access to the information we need to customize Negotiate to WIN for Salespeople for maximum participation and learning. Upon request, Common Ground will be pleased to formalize this promise with a Nondisclosure Agreement. Participants receive a variety of valuable in-class and take-home handouts and tools, including checklists, case studies, samples, guides, pocket reference cards, a personal action planner, and Negotiate to WIN for Salespeople's outstanding Manual (designed as a practical, desktop reference for continued use long after the session). 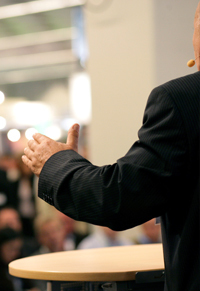 We ask that you provide the training facility, an LCD projector, a screen, a flip chart and markers, and above all, enthusiastic attendees who sincerely want to improve their negotiating skills. Optional items such as sign-in sheets, evaluation forms, writing materials, name cards and badges, and diplomas can also be supplied by you. Our guarantee is very straightforward. It says a lot about the effectiveness of Common Ground training. We guarantee that within two weeks after Negotiate to WIN for Salespeople, you'll recover the price of the session through better negotiating. If not, we'll refund your money.